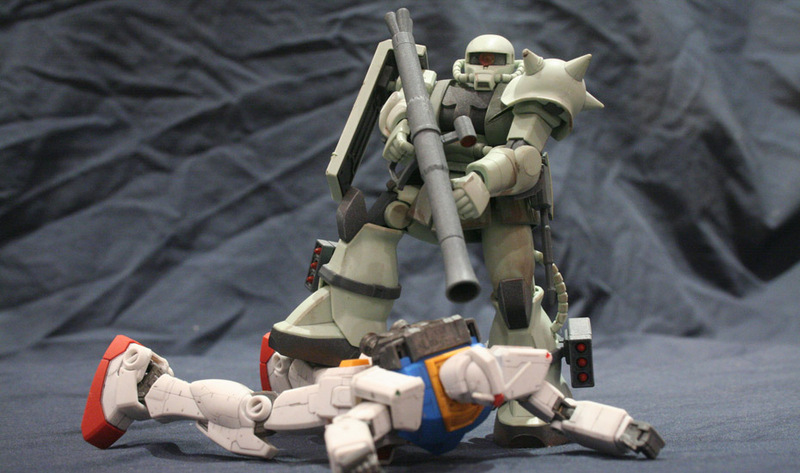 Well despite the quick build I’ve taken forever to get around to shooting and reviewing the HG Zaku, but here it is! I should probably start by saying I’m a big fan of this classic UC suit. The design is simple but effective, and it’s industrial look exudes a WW1 trench warfare vibe, and that mono eye.. classic! 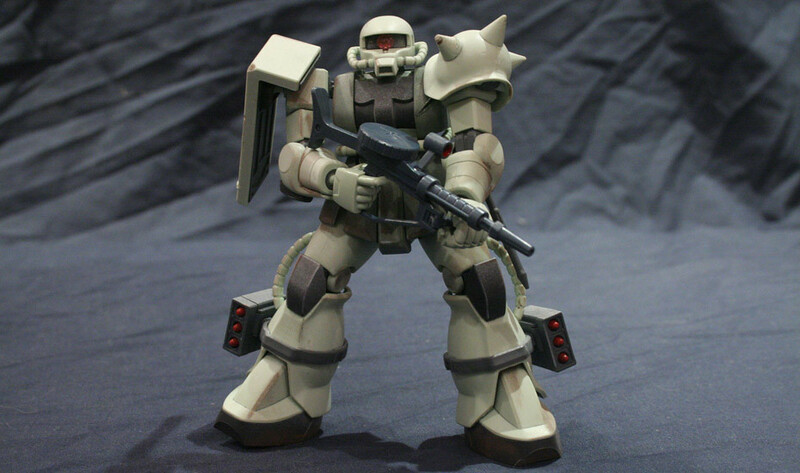 Zaku’s (and variants) turn up in just about every Gundam series, sometimes with very few design changes which is probably the strongest testament to what a great unit this is. 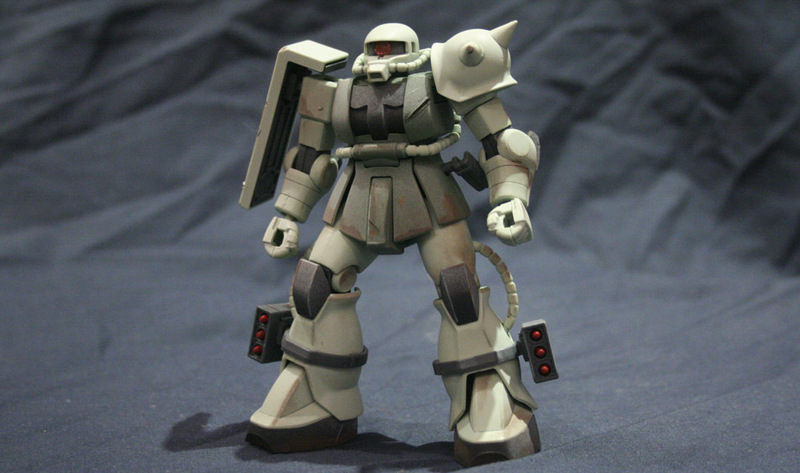 The kit has been panel lined with a Gundam Pencil, then top-coated and weathered using Gundam markers & craft knifes. 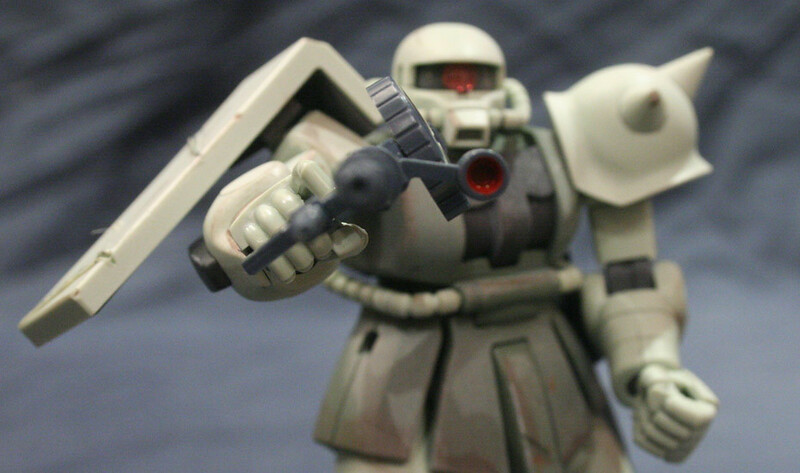 I replaced the mono eye sticker with a clear plastic piece which looks much nicer 🙂 I also painted the blade of the Heat Hawk, missiles and scopes of the machine gun and bazooka. 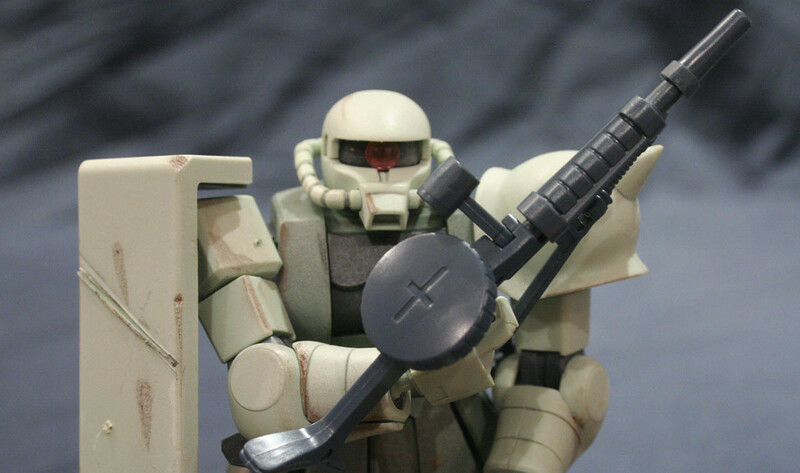 This is an area where the Zaku doesn’t fare too well, a combination of armour design and HG simplicity create a few problems. 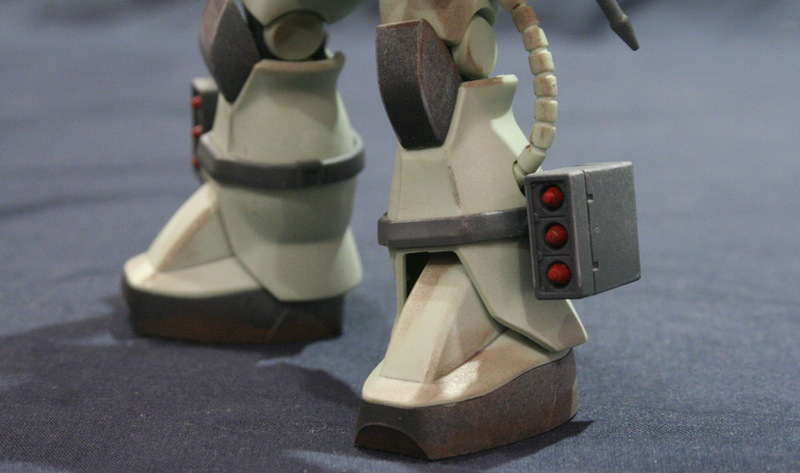 Articulation below the waist isn’t great, the side skirts tend to get in the way, the knee joints don’t have much range either and the feet suffer for not having a joint in the middle – they make for a solid base but don’t make dynamic posing easy! Things are much better in the other areas though, arms are solid and the shoulder shield on the right shoulder can move independently of the rest of the arm so it doesn’t get in the way. The left arms spikey shoulder can be moved too, but there’s not much use for that! Finally, the head can swivel left and right to an extent, but movement can be hindered by the pipes and don’t even think about trying to look up or down – it pops off easily! 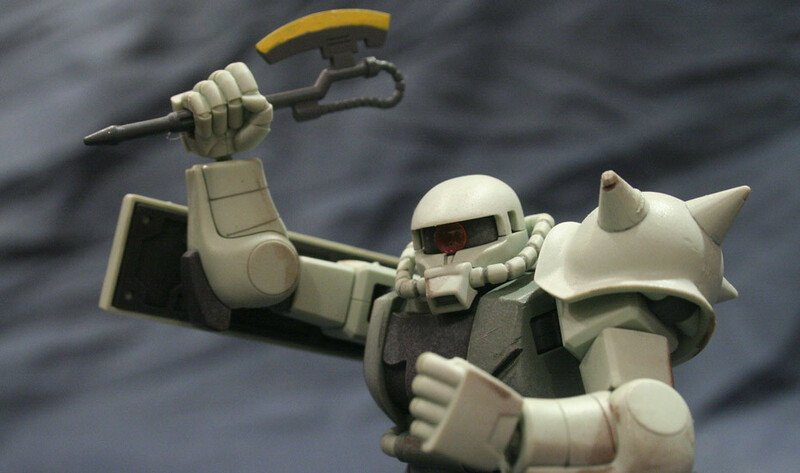 Now here’s where the Zaku shines! 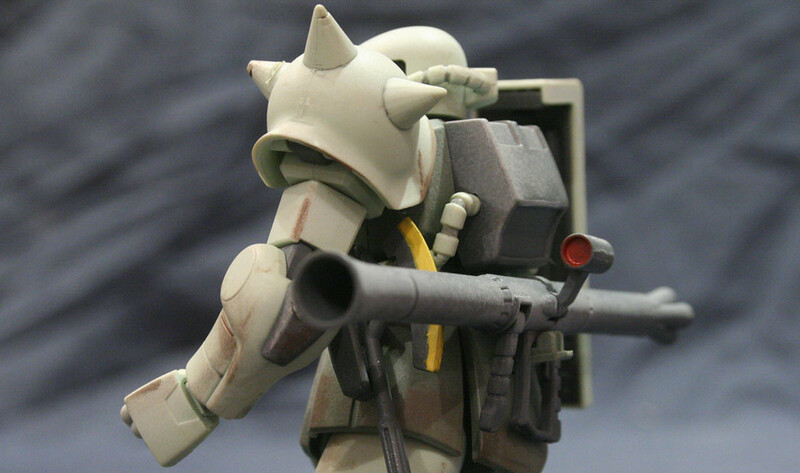 There’s the classic Zaku Machine gun, although articulation issues mean it can’t hold it comfortably due to the long stock. Also included is a Heat Hawk axe, Bazooka and 2 leg mounted missile pods each containing 3 removable missiles. One of the best things about this kit is it can carry most of this at the same time – the Heat Hawk has a holster on the left side skirt, the bazooka can clip conveniently into the back skirt via a flip-down mounting and the missile pods attach far down the legs and never get in the way, leaving the hands free to use the machine gun. A pair of manipulators are provided for each hand, but they’re a bit too loose, meaning weapons tend to slip about a bit. 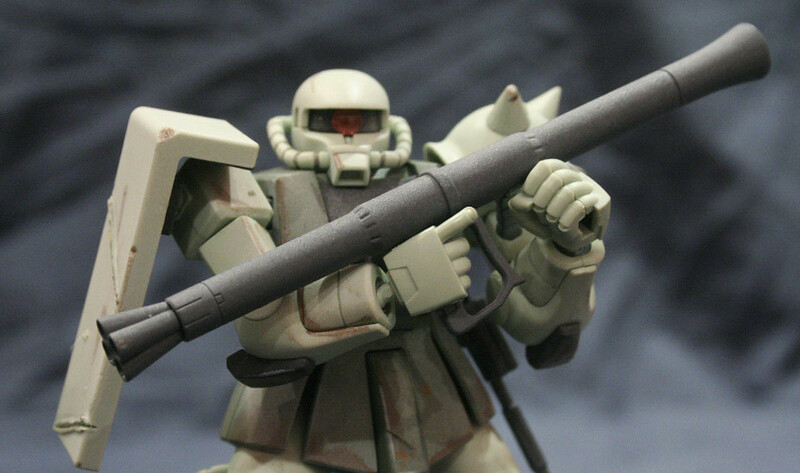 The off-hand doesn’t seem to be cut correctly to hold the second handle of the bazooka too which is a bit of a pain. Yes this isn’t the best kit in the world but it’s still pretty great, despite all the articulation issues I still got some decent poses out of it and the plentiful weapon selection really helps you add some variety. And considering it’s got such a decent price tag (¥800) you can’t go wrong really. As mentioned in previous posts, this is a part of a much larger project I’m working on, so watch this space! Den-Den town, Akiba of Kansai! Very nice review fella,I think you’ve covered all the points. It’s quitr easy to mod the skirt,but the other flaws are much harder. It’s come out looking very good,especially the weathering. Look forward to seeing where this is going,what’s next? Cheers! 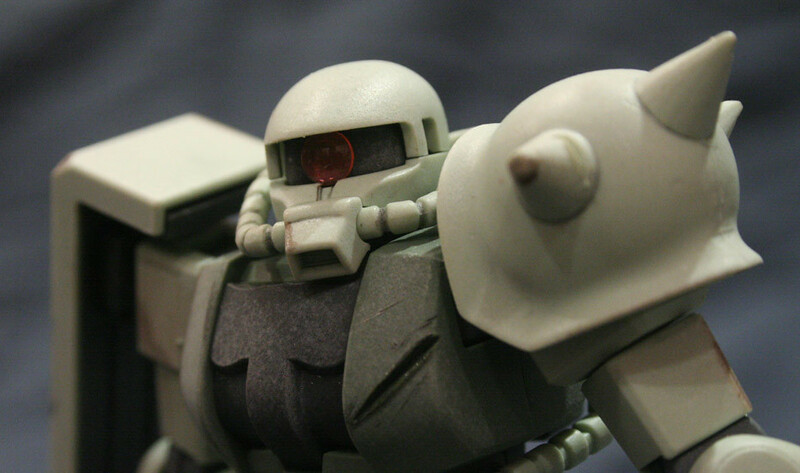 Looking forward to seeing your completed Zaku, don’t sell that skirt mod short, that must’ve been pretty fiddly!